For a mere Rs 300, 27-year-old Somnath Mohanta sells a cycle-load of sal (Shorea robusta) leaves to agent Kathia Naik. Mohanta is least concerned with how much money others will make from his efforts. He is only anxious to somehow earn Rs 1,500 in a month from the leaves he collects from the nearby forest to make ends meet. The leaves are processed into disposable cups and plates and sold all over the country. After the transaction, which takes place in Mohanta's thatched house in Jamuguda village of Mayurbhanj district in Orissa, Naik takes the leaves on his cycle to Betanati town, barely seven kilometres away. He will make a profit of about Rs 50 when he sells it to manufacturers of sal cups and plates. At one such processing unit, owner Ambarish Mohapatra is busy doing some calculations. He's satisfied to find he will make a profit of Rs 5-6 on every sack of leaf plates and cups he sells. The merchandise ends up in the godown of a businessman, who will send out truckloads on receiving "anonymous" calls from Rajasthan, Uttar Pradesh, New Delhi or Haryana. This is how the flourishing but unorganised sal leaf trade completes a full circle in one pocket of the forest-rich Mayurbhanj district. More than 1.2 million of the district's 2.2 million people -- mostly tribals -- are involved in the multicrore business. It is estimated that this trade employs 1.2 million people, in the tribal dominated districts of the state. But it can employ five million people for 100 days in the state if it were organised, believes Vikash Rath of Vasundhara, a Bhubaneswar-based non-governmental organisation, which works on natural resource management through community action. Orissa has 1.7 million ha of sal forests in its western region. Based on information from traders and others involved in sal leaf trade, Down To Earth found that annually Rs 1,095 crore flows into Orissa, while consumers pay Rs 2,096 crore to buy sal products (see table: Profitable and unorganised). The differential amount is shared by primary collectors, village traders, owners and workers of processing units, power companies, agents, transporters, big traders, distributors, retailers and -- last but not the least -- the government. The law is again in the way. In Orissa, the government announced a sal leaf policy in the year 2000 to ensure sustainable use of this resource. The policy declared that primary collectors could collect sal leaves and sell it or its products only through their respective Van Samrakshan Samiti (VSS), to the Orissa Forest Development Corporation or the Tribal Development Cooperative Cooperation. But there are many areas where VSS is either non-existent or inactive. So collection from such areas is either not possible legally or the objective of ensuring sustainable harvesting cannot be met. The policy also put a ceiling on gathering sal leaves: not more than 5 kg could be collected per ha, annually. The policy was revised in 2002, increasing the permissible yield to 200 kg per ha but then set many conditions: when sal could be harvested, how it should be harvested and to whom it could be sold. The principal chief conservator of forests is expected to decide the silvicultural practices and yields based on the forest characteristics of each area. Under it, private traders have to get permits from the divisional forest officers for leaf collection. All this, important as it is for forest conservation, means that the trade is destroyed or becomes illegal. The harassment of tribals increases. Again, rule of the license raj prevails. But this was not enough. 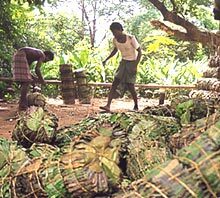 The government then imposes a sales tax of 8 per cent on the goods made of sal leaves. In addition, there is a 4 per cent central sales tax for registered sal leaf dealers and 10 per cent for unregistered. Therefore, people get less and less, while the government earns out of harassment and tax.